The Obama administration has said it wants to work with Congress on ramping up support for Syria’s opposition forces, which have been battling President Bashar al Assad for three years. The United States has spent hundreds of millions of dollars in nonlethal aid and humanitarian assistance since the war broke out in 2011. But there are concerns that some forces fighting against Assad could be aligned with terrorist groups, including the jihadist Al Nusra Front. Those concerns have thus far prevented any public announcements of lethal aid to Syrian rebels. Following Obama’s speech at West Point, officials said they were working with Congress to approve the increased support. They said lawmakers’ approval might be required under the War Powers Act. Rice said on Friday the United States was working with Syria’s neighbors to help alleviate the dire situation of refugees, as well as working to confront an increasing threat that Syria’s becoming a hotbed for terrorists. “We're working on the counterterrorism challenge because as we have seen there are increasingly emanating from Syria the threat of terrorism to the neighbors and beyond,” she said. “Our efforts are increasing and why we'll remain very much engaged, both in trying to support the Syrian people and trying to support the Syrian opposition,” she continued. Maybe we need to send a Top Secret Agent to Libya (Benghazi??) and negotiate a deal with their militia for arms, heavy military gear (hand-held missiles, etc. ), and maybe fighting men, to be delivered through Turkey to Syria. But don't wait until September, oh, uh, eleventh. Not a good day for business in that part of the world. "So Susan Rice is bragging about aiding a group that -1.are terrorist 2. beheaded a catholic priest 3. committed an act of cannibalism. This woman is beyond the realm of stupid. To be fair, we don't know if the people she's referring to are the same people John McCain met with when he went over there. Your description is accurate for the people McCain met with, but there's just no facts on the table to support it one way or the other with respect to the people they are now interacting with. 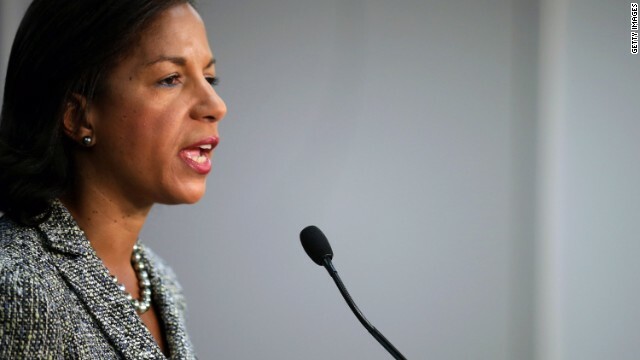 “I don't think the criticism has been fair,” Ambassador Rice. Lady, it don't take someone of YOUR intelligence to come up with that little gem of knowledge. Rick McDaniel – " Obama has gotten us into wars in both Libya, and Syria, contrary to what most people realize. " Barry is a little more subtle with his foreign involvements. No 4000 plus Americans killed. No Two Trillion Dollars wasted. No hundred thousand plus Americans wounded. Barry's just not that into WAR, unlike W-cheney. This is where the rwnj who've been complaining we should do something, now complain we're doing something, and they think they're right both times, lmao. Gotta love watching them chase their collective tails. Dean – " She lies as bad as Obama "
Hundred thousand plus Americans wounded! Oh honestly Rudy, you aren't trying to sell the whopper of Obama knowing how to develop relationships are you? This is the guy that invites Republicans to events, sits then in the front row, then proceeds to attack and insult them., Obama is the guy that openly attacks and ridicules Supreme Court justices on national TV. Obama is guy that attacks and demonizes large segments of our economy and then wonders where all the jobs are. We know that this is a lie, Donna, because the Republicans don't bother to show up, nor have the manners to tell him that they're not coming. The one and only time that Republicans showed for a meeting with the President to discuss and negotiate upcoming legislation was that televised health care summit....and the Republicans showed in full battle armor. Do you remember that? @Sniffit-There are two sides to the Syrian War, the rebels and Assad`s forces. We are aiding the rebels who radical Sunni terrorist who commit acts of terror on civilians even if the aid is not going to those specific terrorist they are still on the side that getting our help. If you believe that there are only two sides in the Syrian Civil War, then you truly are living in a media bubble. Not a week goes by without a report of one group of rebel fighters attacking another group of rebel fighters. There are at least three factions of rebels: those originating within country; those from without; and those who are fighting a Jihad.